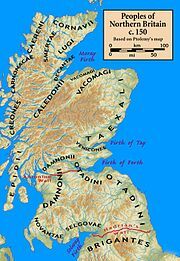 The Carnonacae were a people of ancient Britain, known only from a single mention of them by the geographer Ptolemy c. 150. From his general description and the approximate locations of their neighbors, their territory was along the western coast of modern Ross-shire. Ptolemy does not provide them with a town or principal place. This page was last edited on 4 March 2019, at 11:46 (UTC).